As part of the optional conference programme, participants had the possibility to take part to the critical movie screening of “The Warsaw Uprising”. The movie, introduced by Dr. Karol Mazur, Head of the Educational Department of the Warsaw Uprising Museum, sparked an interesting debate on the use of original footage in the classroom. A fictional screenplay, based on primary sources such as diaries or letters. 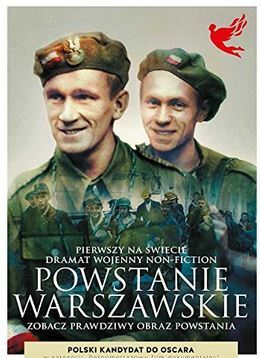 The screenplay follows two brothers, cameramen of the Bureau of Information and Propaganda of the Polish Underground Army Headquarters (BIP), who are sent to witness the uprising and the fighting. It uses authentic footage, sometimes with added sound, including original conversations reconstructed based on lip reading. Would you use the movie in your classroom practice? The purpose of the movie screening was to address the theme of “Bringing History to Life” from the very beginning of the conference. Steven Stegers, moderating the Q&A session after the screening, opened the discussion by posing the following question to participants: Would you use “The Warsaw Uprising” in your classroom practice? The answers to the question were naturally mixed. Some participants argued that screening the movie would offer a very particular ability to depict everyday reality during the uprising. However, others argued that raw, unedited footage offers a more unbiased, realistic view of the events. Someone mentioned that he would screen the documentary in a classroom, accompanied by the question of why students think such a documentary would be developed and screened in 2019, evoking a discussion about rising nationalism. It is safe to argue that this critical movie screening fulfilled its purpose: participants entered into discussions about what kind of methods are out there to bring history to life in the classroom, and what methods should be reconsidered. Although the screening was attended by a small group of early arrivals, it sparked debate, and therefore left an impression, throughout the conference.